October is a month for giving thanks in Canada, and it is Pastor Appreciation Month. I am the envy of many of my colleagues, whose congregations have never heard of Pastor Appreciation Month. I brag a little bit each year – not about what I receive, but about you, and how, even after ten Pastor Appreciation Months with you, I am still surprised, honoured, and humbled by your kindness. I have a collection of cards on my desk; each will be kept, read again, and treasured, as I have done for the past 10 years. I’ve mentioned before that in previous congregations, I had a “happy file”, in which I kept notes of encouragement that I received from congregants. Early on in St. Paul’s, I learned that a “happy file” won’t do; I actually have to keep a “happy drawer” in my desk, one of the deep drawers, to contain all the encouragement I’ve received over the years. I’m sure it’s no secret that your encouragement makes it a joy to serve the Lord among you, and I truly hope that “iron sharpens iron” (Proverbs 27.17), that I am able to be an encouragement to you, too. October has always been my favourite month of the year, with beautifully-coloured leaves and crispness in the air. But you have doubled my delight with your ongoing kindnesses. A culture of gratitude – not only toward the pastor, but from the pastor, and toward one another – makes a church’s culture irresistible to those seeking a church home. So keep up the good work of being grateful, as will I. Again, from the bottom of my heart, thank you. It truly is a joy to serve the Lord together. March also is the month that brings March Break. Students and teachers look forward to that time with great excitement, since it offers them a rest from learning, and teach- ing, and from each other! For some families and individuals, March Break affords the opportunity for some respite from the chill; for others, it’s a chance to make the most of the cold weather. For still others, it’s an opportunity to spend time with loved ones, irrespective of the weather. The month of March is known for the feast day celebrated on the 17th. St. Patrick’s Day is marked not only by Christians, but by many others who simply use it as an ex- cuse for a party. And why not? While many people don’t realize it, Patrick is a saint worth celebrating. Why is that? Patrick is best known as the patron saint of Ireland, and anyone with as little as a drop (or less!) of Irish blood within willingly makes the most of the opportunity to celebrate the heritage of the Emerald Isle with great merriment (and green-tinted libations, I un- derstand). But Patrick is worth celebrating for other reasons. St. Patrick gives us reasons to celebrate good theology and evangelism. We can celebrate St. Patrick’s Day because Patrick was perhaps the most popular theo- logian to articulate a doctrine of the Trinity. A lot of folks assume it all has to do with the three-leaf clover, which might be more of a legend than an illustration of One God In Three Persons. Patrick lived not long after the doctrine of the Trinity was first ar- ticulated by the early Christians, and he helped popularize this important point of Christian belief among the people of Ireland, who had not been that well acquainted, because of distance if nothing else, with some of the basic doctrines of the church. While the Trinity is a difficult theological tenet to explain – it remains a mystery which is clearly alluded to in Scripture but not completely spelled out – it is a hallmark state- ment of faith among followers of Jesus. The one true God, made known in the three Persons of the Father, Son and Holy Spirit, is beyond our complete comprehension. Yet by faith, we can apprehend this truth and experience communion in community with the God who is, in one sense, the very definition of community! For a humorous yet accurate take on Patrick and the Trinity, check out this video. Patrick also gives us reason to celebrate as Christians because he was a master at evan- gelism. He might better be remembered for driving snakes out of Ireland – also a tale of mythical proportions – but his greater feat was leading countless people to faith in Christ. Ireland, in those days, was primarily a land of religious people whose faith was druidic and pagan in nature. He was a missionary. While this is debated hotly, many believe Patrick was born in Scotland, and that he believed God called him to bring Christ to the Irish. He was a master at understanding the culture he sought to transform. He learned what the cul- ture of druidism and paganism meant to the people, and he explained the gospel to them using terms from their own lexicon of faith. As a result, today, Ireland is a nation very faithful to the Roman Catholic Church. (There are many Anglicans and Presbyte- rians there, too, among other denominational groups.) The testaments to Patrick’s ef- forts may be seen in the numerous large and ancient church buildings which still stand from Cork to Dublin, from Londonderry to Belfast. Patrick reminds us of the importance of good theology, and sharing our faith. So March really is a month filled with potential, even for the church! Enjoy it and em- brace it, with God as your guide. We should be more concerned with our sending capacity than our seating capacity. The more I think about the future of the Christian church in Canada, the more I believe that sending is going to matter more than seating. Don’t get me wrong: gathering for worship is crucial to our spiritual development and our maturation as disciples of Jesus. We want to grow numerically even as we grow spiritually. But as time goes on, we are going to have to move from an attractional model of being the church to a missional model. And that says more about going out than coming in. My latest reading has been Al Roxburgh’s book, Introducing the Missional Church (Baker, 2009). Among his premises in the book is a bit of a head-scratcher: the concept of ‘missional church’ cannot be clearly defined. He says that trying to define the missional church is like trying to define the Kingdom of God; it’s just too big to wrap our heads around. However, we can garner principles that will help the church in the future. And key to those principles is getting out and being the church in the community, serving people in mission. That can be a mission of helping, such as doing lawn mower maintenance (or even lawn maintenance) for single moms. It can also be a mission of listening, such as hearing from business owners and school administrators in the community about what the church can do that will make a difference. What are your thoughts on what it means to be missional as a church? I’d love to read your comments and start a dialogue. 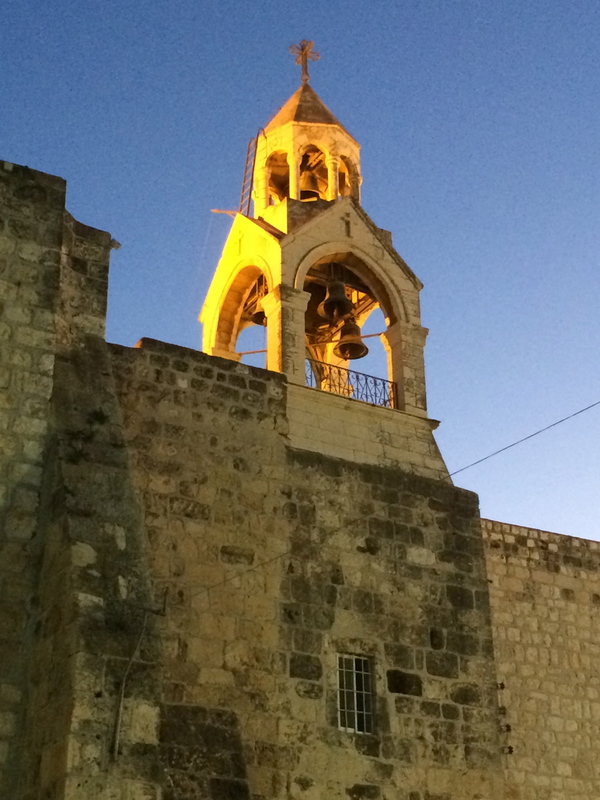 The bell tower on the Church of the Nativity, taken December 2, 2013. Christmas, and a new year filled with many blessings. Celebrate by worshipping Christ, our new-born King! God’s best!